Formed in 2000 by a group of young underground metal heads, TARANTIST originated in the basement alternative rock and heavy metal scenes in their native Tehran, Iran. Having to perform secretly-but-loudly often proved to be difficult, but after sparking a following via word of mouth in the underground, the band soon began to garner international recognition. Within just a few years, international media correspondents inspired by their story (including BBC, SKY, CNN, NPR, Metal Hammer and Kerrang) started visiting Tehran to meet and talk with TARANTIST. These news reports and articles aided TARANTIST in cultivating a worldwide following – motivating the band to relocate to the United States Los Angeles in 2008. Although remaining positive, TARANTIST quickly found that they weren’t able to fully escape the pressures they faced back home, stemming from “not being Muslim enough”. Once they arrived in the United States, they experienced opposite – uncomfortable stereotypes and assumptions directed at them simply based on their culture and/or how they looked – all the while never practicing religion in the first place. Determined, TARANTIST didn’t let this slow them down. After growing some roots in North America, the band was invited to play several festivals like SXSW, CMJ, Canadian Music Week and Intergalactic Fest. TARANTIST quickly added to their touring repertoire, performing on the same stages as Metallica, Motörhead, Stone Temple Pilots, Muse, Cheap Trick, Voivod, Sum 41, My Ruin, Ben Harper and many more. 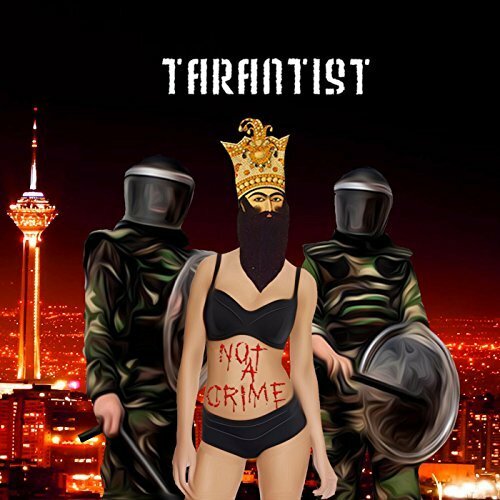 Similar to what their name suggests (tarantism is defined as a mania characterized by an uncontrollable impulse to dance, popularly attributed to the bite of the tarantula), TARANTIST‘s music is energetic and keeps the listener moving and headbanging, incorporating a true heavy metal sound mixed with exotic, Iranian flavor. The band’s lyricism focuses on themes of anti-extremism, anti-corporate system, human rights and support thereof – including women’s rights, religious rights, and freedom of expression in the arts. Bassist/vocalist Arash says, “Instead of writing and singing in English like we usually do, for Not A Crime, we decided to sing/write in Farsi because we felt we need to pay our dues to the Farsi-speaking community and make history with something like this. The kids of Iran (like everywhere else) are being brainwashed by the propaganda and state media. We feel the new generation needs a fresh and uncensored source of awareness, un-diluted music and content, and original material. With this album, we aim to raise awareness regarding human rights issues/violations, freedom of expression in art and music, as well as educating the society and new generation through the story of our lives and what we’ve been through as of today. If interested, all of our lyrics are available in English at www.tarantist.com. TARANTIST remain constantly active – releasing new music and videos and spreading the word of freedom throughout the international arts community. Stay tuned for more coming from TARANTIST in the months to come!